The subject of OC (Ocular Compression) is still in its infancy stage in so far as manual application goes. Much work has been done with VNS (Vagus Nerve Stimuli) implants with humans, and of late, with dogs as well. I have written below, what I've learned from my own research and consulting with my vet. (I am very fortunate to have good sources in both my local vet and my neurologist.) Nevertheless, these are my own opinions and are presented for helping you understand the effect of OC in controlling seizures. Personally, I have had success using OC, but I discussed it with my vet first and I would recommend you do the same (especially if your dog has any eye or eye related problem). OC is simply an application of pressure on one or both eyes. This pressure stimulates the Vagus Nerve which in turn releases GABA and glycine into the brain. GABA is an inhibitor that serves to shut down "messages gone out of control", i.e. seizures, and restores balance in the brain. (See links and extracts below for more information on GABA). Similarly, but oversimplified, this is how AED's, such as PB and valium work; by stimulating GABA receptors. This stimulation results in release of "extra" GABA into the brain on a continuous basis during the effective period of the drug. As the drug wears down, GABA levels return to previous levels. OC does this on a "one shot" basis as pressure is applied to the eye. Large amounts of GABA are sent, widespread, to the brain. Liken it to getting instantaneous, but short-lived results from PB or valium. How do I use OC? OC is a very simple technique, similar to CPR but much easier. I think of OC as being CPR's cousin for seizures. Anyone can do it. It is just a matter of establishing head stability and using fingers or thumbs to exert firm but gentle pressure on the eyeball(s), by pressing on the closed eye(s). I use a pressure about 3/4 times harder than that used for taking a pulse but well below being hard. Like my vet said, "be firm but don't push her eyeballs out". Some form of stabilization will be necessary since you will have to alternate pressure in cycles of about 5 seconds. In one instance, Sheba's head was positioned sideways on the sofa and I just applied pressure to one eye while preventing head movement with my other hand. Cupping the snout is an easy way to stabilize the head. Just be aware not to block or restrict breathing, which could be easy to do in certain circumstances. During OC application, hold pressure approximately 5 to 8 seconds, release, repeat, etc., watch for signs of distress, adjust pressure accordingly and check to insure you are not blocking the dogs ability for breathing. I would continue until results are seen and then for one or two cycles afterward. I have been using 5 seconds in my discussion but this is not an exact science. The amount of time to hold the pressure could vary due to pressure administered, animal sensitivity, etc. I also do not know how long to pause between pressure applications. I have been using 5 seconds here also. It might be prudent to use irregular timing during pauses. A static timing during pressure holding and also during release may be beneficial. It is just a feeling I have, that precise repetitive timing may "decode" to an unintended message in the brain. I doubt we could be precise enough in manual applications for that to be of much concern. . .just something to watch for as we learn more about this concept. Video requires Microsoft Media Player plug-in. If you can't view the video please view it on YouTube. When do I use OC? Start OC as soon as possible ­ especially before the seizure starts if signs of an impending seizure are present. It has proven effective in preventing seizures from developing. If you were not able to apply OC before a seizure, start as soon as possible. If utilized early enough, you may be able to shorten the length of a seizure. Applied after a seizure, you may be able to reduce post seizure effects. 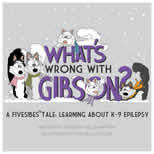 In virtually all cases, post seizure symptoms have been dramatically eased. OC appears to be an effective means of both preventing and aborting seizures. Results seem to be directly proportional to how promptly you can respond. OC appears to almost always reduce post seizure behaviors. Thank you for your interest in OC. It takes only a few seconds to perform, and for your time, you and your companion should get a very big return in the form of relief. In addition you will have a great deal of personal satisfaction in having delivered a personal punch to the "SC" (seizure creature). OC vs. SC. . . may the good guy win! 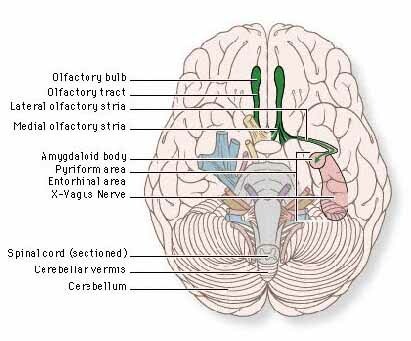 The following diagram shows the location of the Olfactory bulb and the Vagus Nerve. My interest in OC was sparked by this study. . .
1999 "Use of ocular compression to induce vagal stimulation and aid in controlling seizures in seven dogs." Speciale, J. and J. E. Stahlbrodt (1999). J Am Vet Med Assoc 214(5): 663-5. Ocular compression (OC) was used to treat 7 dogs with seizures. Treatment was accomplished by use of digital pressure applied to one or both eyes by veterinarians, hospital staff, or owners. The OC was believed to exert an effect through stimulation of the vagus nerve. Use of OC appeared to be efficacious for aborting seizures in 3 dogs, decreasing heart rate and causing muscle relaxation in 1 dog, and preventing onset of seizures in 2 other dogs. In 1 dog, rhythmic application of OC caused onset of rhythmic facial twitches. Administration of OC may be beneficial in treating seizuring dogs. This clinical study found that ocular compression (OC) may be a useful aid for stimulating the vagus nerve to control seizures in dogs. The globe was intermittently compressed into the orbit, using digital pressure applied to the superior eyelid of one or both eyes for 10-60 seconds. Ocular compression was prescribed at 5 minute intervals, however, compression was also applied immediately when onset of facial twitches was detected. Reasons for use of OC as a treatment for epileptic dogs include the clinical impression that seizures may be aborted and that series of seizures may be curtailed. Although some dogs resumed having seizures immediately after cessation of OC, temporarily diminishing convulsive activity facilitated intravenous or rectal administration of drugs, and, when applied by owners at home, transport of the affected dog to our hospital. Other advantages included relative safety, minimal expense and, possibly improvement of morale in pet owners. GABA or Gamma-aminobutyric acid, is the most important and widespread inhibitory neurotransmitter in the brain. Excitation in the brain must be balanced with inhibition. Too much excitation can lead to seizures. GABA is able to induce relaxation, analgesia, and sleep. Barbiturates [e.g., Pb] and benzodiazepines [e.g., Valium] are known to stimulate GABA receptors, and hence induce relaxation. Several neurological disorders, such as epilepsy are effected by this neurotransmitter. taking it in pill form [GABA supplements] is not always an effective way to raise brain levels of this neurotransmitter because GABA cannot easily cross the blood-brain barrier"
http://www.sfn.org/content/Publicationss/briefings/epilepsy.html "If a sufficient amount of GABA is lacking, however, the system goes out of whack, and tens of thousands of neurons send messages rapidly, intensely and simultaneously, resulting in a seizure"
1999 "Use of ocular compression to induce vagal stimulation and aid in controlling seizures in seven dogs." Speciale, J. and J. E. Stahlbrodt (1999). J Am Vet Med Assoc 214(5): 663-5. *Zabara J. Inhibition of experimental seizures in canines by repetitive vagal nerve stimulation. Epilepsia 1992;33:1005-1012. Real life experiences with OC from Epil-K9 list members. . .
. . .acted as if he were about to go into a seizure . . .started talking to him telling him what a good boy he is,etc, etc, etc,. . .then I remembered the eye thing! [OC] I was standing to the side and behind him and I just put my fingers over his eyes and gently pushed inward for a few seconds while talking to him. I have no idea if any of this helped or not, but he did not have a seizure and it made me feel like I had some control? I will use this technique again. I didn't get a chance to prevent the seizure but I was on her seconds after it started and it was all over in about 30 seconds, and she was up and stable in 5 min. Those are significant better-ments. Seizure time was reduced by close to 50%, the post period, more dramatic - between 100% and 150%. And as for the feeling of control mentioned by Johanna - let me tell you, When those feet stopped paddling within seconds of applying pressure, (way short of all previous periods), I couldn't help thinking "gottcha, you bugger". "I'm on your side of the ropes now ... in the ring with you and not for booing". Maybe it was bad luck to ask Don for the documentation on the Ocular Compression (vagus nerve stimulation) on Friday because low and behold Sava seized yesterday afternoon and I now have my firsthand experience with the technique I guess I knew I would have to use it, just at least to see what would happen, but I was hoping not so soon after Sava's last "visit" which was only 2 weeks ago to the day. I do have to say that there was absolutely no post ictal behavior. When Sava was finished he was finished. I did though follow up with the ice cream and RR. His seizure did only last about 20-25 seconds but was more violent than the one two weeks ago which I did not use the OC to deal with. At this point I am still impressed with the results of the OC and will use it again and will recommend it to anyone. I have taken Sava and just tried to get him used to my fingers over his eyes by "practicing" the method when there is no need for the procedure. I want him to feel comfortable and not be afraid when we do need to do it just incase he is aware of what might be going on. Anyway, many thanks to Don for the information. I am convinced that this procedure saved Sava much post ictal behavior and actually brought him back to me very quickly no worse for the wear. I was so excited that Mugsy had been seizure free for 16 days but of course we had a monster visit yesterday morning at 2 am. It was a GM so this was the first chance I got to try the OC. I did it! The seizure only lasted about 20 secs. and I followed up w/ the regular RR and ice cream and his post ictal pacing was only about 10-15 mins. Don't know if it was the OC but it definitely made me feel as though I spared him some discomfort. . . .this afternoon Rose had her second seizure (the usual and customary 2nd seizure that follows within 24 hours of the first, which occurred yesterday morning at 6:15AM). Hubby and grandson were in the basement working on a project and Rose was down there with them. I was getting ready to go to the market when my grandson ran out to tell me Rosie was having a seizure. By the time I got to the basement the seizure was over - but she was still in the "Mom, I'm a little confused and really tired" phase. Bud (hubby) told me that it was a short one. He said he did OC's - as best he could - and that the seizure was only about 20-30 seconds. Shortest one ever!! Now, this is why I believe OC's definitely help: I left for the store directly after we got her cleaned up and had given her ice cream and RR. I didn't do any compressions before I left, thinking that Bud would. He didn't. Rose had a longer lasting post-ictal than she'd had in a long time. I came home about an hour later and Bud said she hadn't stopped pacing and whining the entire time. I gave her another shot of RR and did quite a few compressions. BAM - she settled down --- right away! OK - so maybe we can't stop the seizures completely with OC - but I definitely feel we can help decrease the severity in both the seizure and the post-ictal phase. During Nik's last bout of seizures, she didn't mind the OC at all. The fourth time I did it (after her fourth seizure), I got the "mom, leave me alone" reaction. She didn't have any more seizures. So, from my totally unscientific observations, she seems to enjoy it when she needs it, but dislikes it when she doesn't. Maybe kind of like me pressing on my eyes when I have a headache makes my head feel better, but doing it when I don't have a headache is uncomfortable. I use the heels of both hands. I press her eyes with the heel of my hand and use my palm and fingers to hold her head still. This works better for me than thumbs or fingers, helps me keep her head still, and she seems to like it better. As I stated at the beginning, always check with your vet before trying OC! University of Tennessee, Knoxville, TN advisor to Epil-K9. Using the fingers, the eyeball was intermittently compressed by pressing on the upper eyelid of one or both eyes. The duration of each ocular compression was 10 to 60 seconds. This was repeated at 5-minute intervals. It was also used when facial twitching was detected. This was continued for varying periods of time, in some cases up to 12 hours. The results were evaluated in 7 dogs. Results varied among different dogs and even in the same dog at different times. In some cases the seizures stopped while in other cases the seizure continued. In some cases the seizure stopped but recurred as soon as the ocular compression was stopped. The authors felt that this treatment often influenced the course of seizures but because the onset and termination of seizures are unpredictable, they did not conclude that the treatment was definitely beneficial. The benefit, if any, was attributed to stimulation of the vagus nerve. Ocular compression has been used to stimulate the vagus nerve to slow the heart rate in dogs with abnormally fast heart rates (sinus tachycardia). An implanted pacemaker has been used to intermittently stimulate the vagus nerve in the neck to treat seizures in people and dogs. First, there is a risk of being bit when handling a dog during a seizure. Ocular compression usually caused slowing of the hear rate, but no detrimental effects were noticed in this study. Finally, it's possible that such treatment could increase seizures. When the vagus nerve pacemaker was initially studied in dogs, certain patterns of stimulation increased the seizure-like activity on the EEG, while other patterns decreased such activity. In one dog in this study, ocular compression was delivered in short pulsations, rather than continuous pressure. In this dog facial twitching became synchronous with the ocular compressions, suggesting this may have increased seizure activity. It's clearly difficult to draw definitive conclusions from this uncontrolled study. It's unlikely that fairly gentle pressure will cause any eye problems in normal dogs, but this treatment may not be appropriate for dogs with underlying eye disease. Also dogs with heart disease may have problems when their heart rate is slowed. I have tried this treatment on a number of dogs in the hospital and can't say I detected any effects, positive or negative. But it might be something to try in dogs that have clusters after discussing this with your veterinarian. Ref: Speciale and Stahlbrodt. JAVMA 214:663-665. Florida State University to the Poodle List on March 1, 2002. Reprinted with permission. Barbara is also a member of the Epil-K9 List. I wanted to make a couple comments in response to the posts on the ocular compression technique for dealing with seizures. In 1999, there was one article published in the Journal of the American Veterinary Medical Association (volume 214, pgs. 663-665) that describe the use of this technique with 7 dogs that had seizures. Because this study was not scientifically "controlled," conclusions about the effectiveness of the ocular compression technique were only "suggestive." Still, this study received a lot of attention from both owners and veterinarians. The attention was understandable given the desire on the part of owners, their veterinarians, and epilepsy specialists to find alternative treatments for seizures that seem relatively safe and inexpensive. Like others, I was delighted by the possibility of a new, relatively safe technique (with no monetary cost) that could be added to the list of existing treatments for seizures. Still, I feel the need to point out some important qualifications. The technique was designed to shorten the length of a seizure. And for owners who can tell when their dog is about to have a seizure, it also can be used to try to prevent that seizure from occurring. Briefly, the owner applies pressure to one or both of the dog's eyeballs by pressing gently on the closed upper eyelid(s). In the study, they applied steady pressure for 10 to 60 seconds at a time. Then they waited 5 minutes before applying the pressure again. This cycle was continued for different periods of time with different dogs and different seizures--sometimes for 12 hours. The results of this one study were suggestive, but definitely not conclusive because this was not a controlled study and the number of dogs (7) was very small. More specifically, for many of the dogs, at least *some* of their seizures "appeared" to be shortened or prevented. I don't recall the exact number of dogs that appeared to be helped on some occasions, but I think it was around 5 of the 7 dogs. However, because seizures are not always the same length for a given dog, it is difficult to know for certain whether a shorter-than-usual seizure was due to the ocular compression or whether it would have been a shorter than usual seizure even if the ocular compression had not been used. Similarly, while many owners can tell when a seizure is about to occur, most of these owners also report that there are times when they are pretty certain that a seizure is about to occur, but for some reason it doesn't occur. So if an owner applies ocular compression at the first sign of a seizure, but the seizure does not occur, it is not possible to know with confidence whether the ocular compression prevented that seizure or whether the dog wouldn't have had a seizure at that time anyway. Because gentle pressure to the eyelid(s) appears to be pretty safe for most dogs, many people, including myself, feel it is worth trying on your dog when a seizure occurs or when you think a seizure is about to occur. However, there are some important qualifications. First, and very important, this treatment may not be safe for dogs with any eye disease. So you should check with your veterinarian first to be sure that your dog has no underlying eye disease that may be aggravated by putting pressure on the eyelids. Second, certain compression patterns may actually *increase* seizures. In the study, facial twitching in one dog actually appeared to increase when the eyes were compressed. In this case, the dog's eyes were compressed with a pattern of very brief compressions rather than the more steady pressure described above. So while it is possible that certain patterns of compression may help, other patterns of compression may hurt, and this may vary across dogs. So the pattern that helps one dog may not help another. Third, the procedure slows the dog's heart rate. While this slowing may be part of what is beneficial, if your dog suffers from a very slow heart rate to begin with, it could be problematic. It wasn't problematic in the study, nor have I heard of problems when it was used elsewhere. But it hasn't been used on a large enough number of dogs yet to know for sure. Fourth, although very infrequent, there always is the possibility that you could get bit during the seizure if your hands get too close to the dog's mouth. Remember, even the sweetest dog in the world can bite you during a seizure or during the recovery period if your hands get too close to his/her mouth. In conclusion, while I am pleased about the possibility that this procedure may help some dogs with seizures, I do think that the jury is still out as to what its effects really are. However, as long as you keep the above 4 qualifications in mind, it certainly is worth trying. If owners do try it with their seizing dogs (any breed), I would like to get the details from you in terms of how often you tried it, and what the effects appeared to be each time. In other words, I'll collect my own "uncontrolled" data <grin>.